When your loved one is battling addiction, you feel every up, you feel every down, you feel the highs, the lows, you celebrate every victory, and you mourn every defeat. The reality is you get left feeling tossed about not really certain when the next wave is going to come and where it’s going to leave you. It's important as you walk through this storm that you find a safe place to anchor to. Otherwise your well-meaning attempts to help and love for your family member can pull you out into vast storm of this addiction. I did a little research on selecting the right anchor for a boat. When choosing an anchor the ship’s owner is concerned with the holding power of an anchor. The right anchor doesn’t have to be that big relative to the size of boat it’s trying to secure. What blew my mind was that a small anchor of just 5 lb. can hold 1,000 pounds in place. Such a powerful word picture. Just a little bit of hope can have incredible holding power. Hope is the little voice deep inside of you whispering "maybe" when the rest of the world is screaming no. Hope is what allows you to be driven to your knees day after day trusting that God will not fail in His promises toward us! 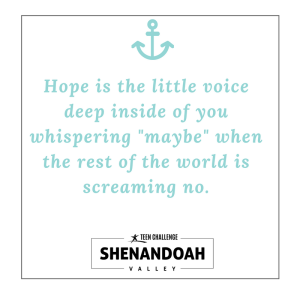 Hold on to Hope today. Be anchored in Him! Hows your hope today? Is there anything we can pray with you about?